Two months ago, Camden County Jail Corrections Officer Christopher Bowie arrived at the jail to work his Sunday shift. Little did he know that he would soon be arrested and charged with drug-related crimes. After he arrived at work that day, authorities conducted a search of Bowie’s person and his vehicle. During the search, they found Bowie to be in possession of Suboxone, Xanax, and Oxycodone. Following the search, Bowie was arrested for having the drugs in his possession. The Camden County Prosecutor’s Office Special Prosecutions Unit has charged him with three crimes related to the drugs found to be in his possession, namely drug possession, manufacturing, distributing, or dispensing a controlled dangerous substance and official misconduct. At this point in time, it is uncertain whether Bowie will proceed to trial on the charges or plead guilty. However, we do have a glimpse of how the prosecution intends to frame their case against Bowie because of the statement the Camden County Prosecutor’s Office released on November 5, 2018. In its statement, the prosecution has alleged that Bowie had the drugs in his possession to distribute them throughout the jail. Based on the facts of the case that are known to the public thus far, Bowie has multiple defense strategies available to him, some of which are outlined below. While his criminal charges are still pending, Bowie has the option of filing different pretrial motions to try to get the charges against him dismissed. One pretrial motion that he can file is a motion to suppress the evidence of the drugs found during the search so that it cannot be entered as evidence at trial. If this motion is granted, then the prosecution, without evidence of the drugs, may feel as though it has insufficient evidence to win at trial and decide to dismiss the charges against him. Another pretrial motion Bowie could decide to file is one challenging the lawfulness of his arrest. One way Bowie could do this is to argue that the authorities that arrested him did not have probable cause to arrest him. If this motion is granted, then the criminal charges filed against him would most likely be dismissed. In the event that he cannot get the charges dismissed prior to trial, Bowie can choose to proceed to trial. This may be a good strategy for him if there is a way his counsel, or himself if he is unrepresented, can illustrate that the prosecution’s case raises reasonable doubt of his guilt. One way Bowie could illustrate that there is reasonable doubt concerning his guilt is by undermining the credibility of the prosecution’s witnesses. By doing this, the jury may be less inclined to believe the evidence the prosecution presents against Bowie at trial. If all else fails, Bowie also has the option of trying to negotiate a plea agreement with the prosecution. This option may yield beneficial results for Bowie because, while he would sustain one or more criminal convictions, he can bargain for a more lenient sentence or for convictions on less than all of the crimes charged. As more facts unfold, there may be more defenses Bowie can pursue to defend himself against the crimes charged. The above-listed defense strategies are, however, strategies generally available to those accused of drug-related crimes. Were you arrested or charged with drug crimes in New Jersey? The consequences of a conviction could be severe, leaving you with a permanent criminal record and possibly even sending you to jail. That is why you need to speak with a qualified criminal defense attorney as soon as possible about your case. 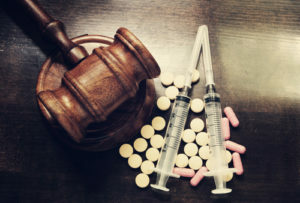 The attorneys at Law Offices of Lauren E. Scardella have successfully represented clients charged with drug crimes in Hamilton, East Windsor, Princeton, Robbinsville, and throughout New Jersey. Call (609) 587-1144 or fill out the online contact form to schedule a free consultation with a member of our legal team. We have an office conveniently located at 2653 Nottingham Way, Hamilton, NJ 08619. Your Miranda Rights: What Do They Really Mean and When Do They Apply?